If you had any doubt that Sony marches to the beat of its own drum, the 13-inch VAIO Z Series is all the evidence you need. While other laptop manufacturers are unleashing dozens of CULV ultraportables in the $800 to $1,000 range, the $2,009 Z Series is a three-pound, inch-thick machine with the specs of a workstation: a speedy Intel Core i5 processor, dual SSDs, 4GB of RAM, NVIDIA GeForce GT 330M discrete graphics and an optional Blu-ray drive. It sounds and looks glorious, but can the Z manage more than three hours of battery life or handle some gaming without turning into a space heater? Or does it totally blow the caps off the budget ULV laptops on the market and make it worth the $1K premium? We've been using the oh-so-pricey and attractive laptop for the last few days, so hit the break for our full review. 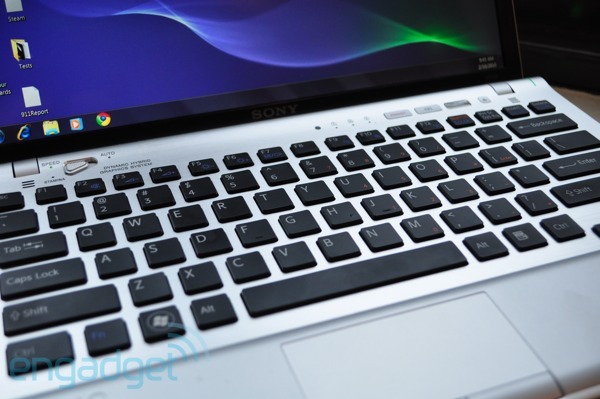 Sony has stuck with the minimalistic and metal design of the previous VAIO Z, and we're more than okay with that -- we'd probably break down in tears if they removed the glowing neon green power button in the circular hinge. Overall, the silver carbon fiber case and aluminum keyboard panel feel surprisingly tough given how thin and light the three-pound chassis is. Actually, in hand it feels lighter than some netbooks with six-cell batteries, and we had no problem sliding this puppy into a small shoulder bag. And the fact that the laptop still manages to find home for a fair share of ports -- three USBs, a VGA, HDMI, Ethernet, ExpressCard/34 slot, MemoryStick and SD card -- and an optical drive is quite a feat. Our unit came with a standard DVD drive, but you can configure it with Blu-ray if you've got an extra $500. Sony was one of the first companies to employ the chiclet keyboard style, and we're still head over heels for the Z's smooth and well spaced keys. 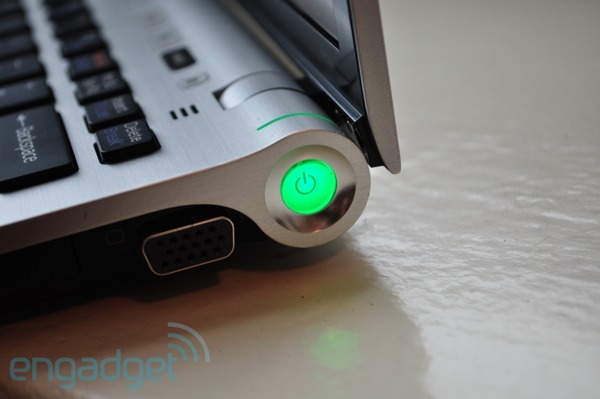 The keyboard is now backlit, and though it relies on a neat ambient light sensor we wish there was a manual control. When we turned out lights the backlight immediately turned on, but when we were in a dimly lit room it didn't initiate. We have no issues with the touchpad; it's large enough and the right / left mouse buttons don't require too much of a press. A fingerprint reader is nestled in between the buttons, but out of the box it was disabled so it was no bother. 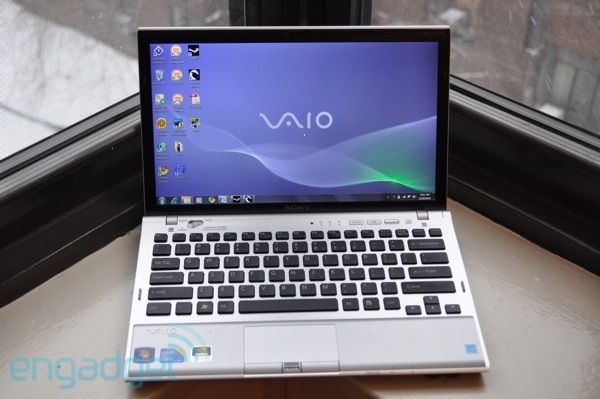 While cheap laptop screens are riddled with poor viewing angles and a glossiness that make them more useful as a mirror than a display, the plus $1,800 VAIO Z's matte 13.1-inch, 1600x900 resolution LED screen is something to rave about. Horizontal and vertical angles were not an issue, and colors were incredibly bright and vivid when we watched an episode of Lost. Little to no adjustments were required to the angle of the scratch-proof screen when lying in bed to watch -- not something we can say for most laptop LCDs. The Z's speakers are decent for such a small system, and Sony has been kind enough to include a set of nice sounding earbuds in the box. 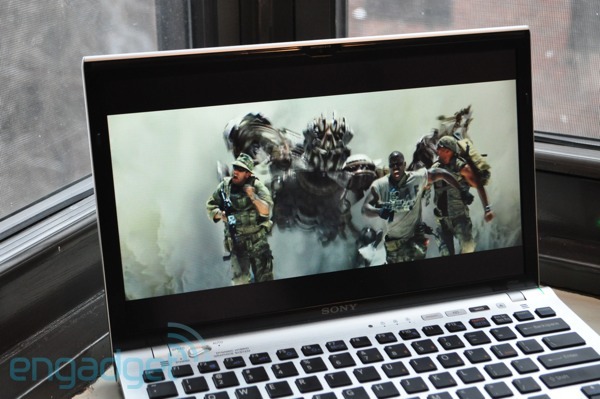 Sony managed to cram a 2.53GHz Intel Core i5-540M processor and 4GB of RAM into the slim Z Series, and the performance speaks for itself. Beyond notching an extremely high PCMark Vantage score, the laptop was incredibly snappy and didn't show any performance lag when running TweetDeck, Google Chrome, GIMP, iTunes and a DVD in Windows Media Player concurrently. But the Core i5 processor isn't the only spec to thank for the speedy performance; the Z is also equipped with a whopping 192 GB of solid state storage (a 64GB and a 128GB drive). To say that this duo is fast is an understatement: it opened a 10MB PDF in under 2 seconds and a slower-to-open program like GIMP in 5 seconds. While the integrated Intel GMA HD graphics were fine for basic everyday tasks, the 1GB NVIDIA GT330M was better suited for handling high-def video and 3D games. Batman: Arkham Asylum rocked 21fps at the native resolution, and a 1080p Transformers trailer on YouTube played smoothly, not to mention looked stunning on the screen -- have we mentioned we love this screen? Sony's Dynamic Hybrid Graphics System isn't as automatic as the ASUS UL80Vf's with NVIDIA Optimus, but is a decent hardware based solution. The Auto mode option defaults to using the discrete graphics, but pull the AC adapter and it will automatically switch to the IGP to save battery life. If you prefer to do it all manually, there's a three way toggle above the keyboard. With all that Sony has managed to fit into the Z we were expecting extremely warm temperatures from the bottom of the chassis and the palmrest, but the system actually ran quite cool. There was some fan noise when we fired up graphics intensive applications, but it wasn't too bothersome. Similarly, the optical drive was no louder than usual when watching a DVD. So for the million dollar question: how do these high-performance parts affect battery life? With the discrete graphics turned off, the 57Wh battery lasted for 4 hours and 25 minutes on our video rundown battery test with brightness to 65 percent. That translated to about six hours of usage when we used the laptop to surf the web and write this review in Microsoft Word 2007. That isn't as long as ULV laptops like the ASUS UL80Vt, but in truth we were actually expecting the Z to do much worse considering the Core i5 Toshiba Satellite E205 only lasts 3.5 hours. The battery life isn't stellar, but if you are headed from New York to Cali the Z should get you through the flight. In typical Sony form the Z Series is loaded up with a number of applications including its own proprietary Media Gallery and Evernote for VAIO, and an assortment of not-very-useful free trials -- though if you configure the Z online you can opt to get a "fresh start" that removes all of these applications. We do have to say that the preinstalled Google Chrome browser is a nice touch, and saved us Internet Explorer haters the step of having to download it when we first powered on the box.